No, it's not because of the peace and quiet... though that certainly is nice in my otherwise chaotic house. But that's not it. It's the routine of it. Teeth are brushed, PJs are on, electronics are off, and the cuddles... oh those cuddles are my favorite. My kids are busy, busy, busy throughout the day, playing and doing the kid thing... they don't have the time to stop and love on their mama. But those nights, we make up for it! Curling up with a good book together... what could be better? This sweet book will make sure your little one falls to sleep feeling secure and loved. Bedtime Bibles and storybooks are evergreen classics that sell through year after year. Seasoned brands and new names alike are seeing surging sales in this felt-need genre as parents are looking for comforting books with Bible stories, verses, and prayers to settle kids down to sleep. 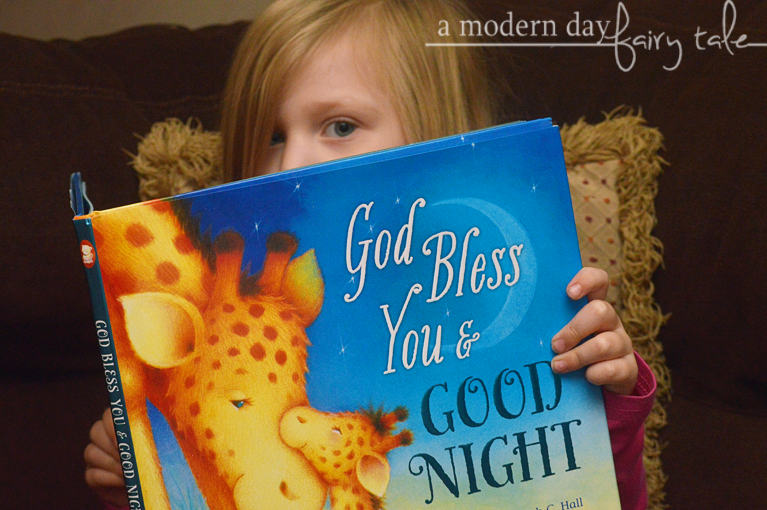 In "God Bless You and Good Night," sleepy little ones are reminded of God's blessings and how much they are loved. The delightful rhyming story takes readers through several scenes of snuggly animals who are getting ready for bed. These sweet, sometimes silly rhymes and adorable art are sure to make "God Bless You and Good Night" a favorite part of the bedtime ritual for parents and children. This book is absolutely adorable! You know what my kids love more than bedtime snuggles? Cute and cuddly animals! With each turn of the page we see another beautifully illustration featuring a mama animal and her baby, living out those favorite bedtime routines we know and love. My kids love the sloth, but I'm pretty partial to the sweet mama and baby giraffes featured on the cover. This book has been around for a few years now- perhaps you even have a copy yourself- and one read through will leave no doubt as to why this is already beloved by so many families. It's a sweet story and a very quick read, making it great for both those shorter attention spans AND those kids who want to read it 'just one more time' before they drift off to sleep. It has a fantastic rhythm as you read that helped to draw my kids in, making it easy to follow... but it actually gave it a nice lullaby like quality that seemed to help them calm away to sleep. Isn't that what a great bedtime story should do? This has very quickly become a bedtime favorite in my home and will continue to be for many years I am sure. It truly is the ideal bedtime story--- perfect for baby showers, first birthday and so much more! It is available to purchase now at your favorite Christian book retailers.